July 17, 2013 - The FAA and the general aviation industry have compiled data on over-the-counter medications (OTCs) and its effects on pilots. The report is stunning to say the least, the report indicates that 12 percent of fatal general aviation crashes in the past decade were due in part to the use of over-the-counter medications. Over the Counter medications (OTCs) are legal, nonprescription substances taken for the relief of discomforting symptoms that may be in capsule, tablet, powder or liquid form. This could also include topical agents as well as agents that use a dermal delivery system (i.e. patch). Some of the more common over the counter (OTC) medications would include - Analgesics: This would include Non-steroidal anti-inflammatory drugs (NSAID) such as Ibuprofen, aspirin, and acetaminophen. Cold and flu medications fall into categories such as antihistamines, decongestants, and cough preparations. Bowel, or gastrointestinal agents such as laxatives and anti-diarrheals. Stimulants such as caffeine, dietary supplements, including agents such as amino acids, vitamins, herbal and mineral/vitamin combinations. All of these can impair a pilot's ability to safely fly an aircraft. As a result of these findings a letter went out today to alert the nation's estimated 450,000 general aviation pilots, warning them on the use of over-the-counter medication while flying and to pay careful attention to any medications they may be taking. The letter also recommends that pilots to pay careful attention to the side effects of any medication, and recommends that pilots should wait as long as five times past the dosing interval before climbing into a cockpit. Bruce Landsberg, president of the Aircraft Owners and Pilots Association (AOPA) Foundation said "So if it was an eight-hour medication, you might go as long as 40 hours before you get into an aircraft. 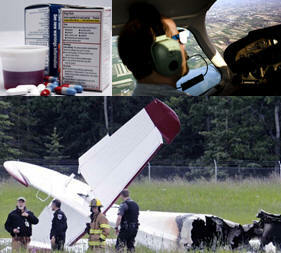 It's important for pilots to understand that any medication that they take may have some kind of side-effect". In a statement, the FAA stated it believes with education pilots can make themselves aware of the potential detrimental effects of over-the-counter medications. In an FAA brochure entitled "Medications and Flying," the FAA indicates pilots should not fly while using any medication. Over-the-counter medications can cause light headedness, dizziness, drowsiness or visual disturbance and any warning on a label against operating motor vehicles or machinery while on the medication should be a red flag. - NTSB Identification: LAX06FA089 - Accident occurred Friday, January 13, 2006 in Visalia, CA - Aircraft: Piper PA-30, registration: N7291Y Injuries: 4 Fatal. Piper PA-30 aircraft stalled while the pilot was turning from the base leg to final at his home based airport and impacted the ground in an uncontrolled descent. The airplane came to rest 410 feet from the approach end of the active runway. The ground scars and wreckage deformation signatures indicated the ground impact occurred with a high vertical component and very little horizontal energy. Night visual meteorological conditions existed with calm winds. Examination of the wreckage did not reveal any mechanical anomaly to preclude normal operation of the engines or the airplane control systems. No personal flight records were located for the pilot. Based on interviews with acquaintances and family members, the pilot flew often. On his most recent Federal Aviation Administration airman medical application, dated about 1 year prior to the accident, he noted a total flight time of 5,700 flight hours with 75 hours flown in the past 6 months. Review of the pilot's medical records from his personal physician revealed that the pilot had been experiencing back pain that seemed to significantly interfere with his ability to sleep. The toxicological results were positive for extremely high levels of doxylamine, a highly sedating over-the-counter antihistamine, often used in sleep aids such as Unisom Sleep Tabs. The substance had likely accumulated due to daily use and/or use in excess of the maximum recommended dose. The pilot was likely having difficulty obtaining adequate and/or qualitative sleep. The National Transportation Safety Board determines the probable cause(s) of this accident to be: the pilot's failure to maintain airspeed during the landing approach, which resulted in a stall and uncontrolled descent. Contributing factors to the accident were the pilot's impairment due to his prolonged use of a highly sedating over-the-counter sleep aid and fatigue due to lack of sleep.